Marty is guided by the belief that every single person deserves dignity, security, and opportunity. Marty Walsh, the 54th Mayor of the City of Boston, has spent his life fighting for working families and those needing a second chance. From his days as a labor organizer, to his 17 years in the Massachusetts House of Representatives, and his five years leading the city as mayor, Marty has always been committed to growing opportunities for everyone in Boston, no matter who they are or where they come from. Above all else, Marty is guided by the belief that every single person deserves dignity, security, and opportunity. As Mayor, he leads with the conviction that Boston is a true community that leaves no one behind. With compassion and with grit, he’s taken on Boston’s toughest, long-standing challenges. Ending Homelessness: By streamlining and strengthening services, over 1,600 formerly homeless individuals now have safe, supportive homes. Marty’s work has put an end to chronic homelessness among veterans in Boston. Investing in our Students: Marty has made record investments in the Boston Public Schools, expanding high-quality pre-kindergarten, building the first new, modern high schools in a quarter-century, and lengthening the school day. Results include record numbers of high-performing schools and a historically high graduation rate. Public Safety: Taking office at a time of national concern about police-community relations, Marty made sure the Boston Police Department is a model of community trust, he appointed Boston’s first African-American police commissioner and established the first-ever Bureau of Community Engagement at BPD. Boston’s crime rate has fallen by 25%. Housing for All: Marty’s Housing Plan got Boston on track to end a historic housing shortage, building and maintaining more income-restricted affordable housing than any other major city in the United States. Creating Opportunities: Marty’s economic vision has led to the creation of over 100,000 new jobs in Boston, record-low unemployment rates, and more job training opportunities and small business investments than ever before. Protecting our Environment: Marty made Boston a global leader in the fight against climate change, with a Resilient Harbor Plan to protect Boston from rising sea levels, and a Carbon Free Boston strategy to become 100% carbon neutral by 2050. Standing with Immigrants: Marty led the fight, both locally and nationally, to protect and welcome immigrants. Boston is home to 29% new immigrants and 48% first generation of immigrants, including Marty. Immigrants play an important role in our community and economy. Marty’s Office of Immigrant Advancement supports and welcomes all immigrants and their families through a variety of programs and services. Road to Recovery: Marty created the nation’s first municipal Office of Recovery Services to help those suffering from substance abuse disorder in Boston, and used his platform to put the opioid crisis on the national agenda. Equal Pay for Women: Marty’s Office of Women’s Advancement pioneered new strategies to close the wage gap by empowering women with free salary negotiation workshops and is working with employers to report and analyze their wage data. Over 30 other cities have adopted part of the national model Boston has created. 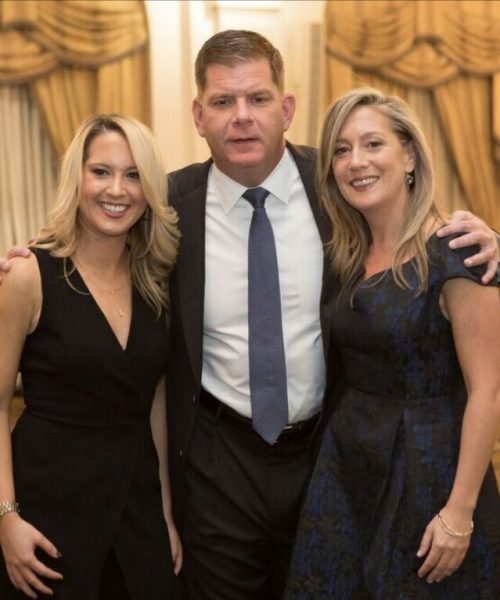 Marty Walsh with his longtime girlfriend Lorrie Higgins and her daughter Lauren. Marty’s heart for working people and underdogs is deeply rooted. He is a proud product of the City of Boston, born to Irish immigrants in Dorchester and growing up with a strong sense of community. Marty’s father and his uncle were active in the leadership of Laborers Local 223, and the Walsh household was always filled with discussions of politics and the importance of fighting for the underdog. From an early age, Marty understood in his bones the building blocks of America’s middle class in good jobs, affordable housing, strong schools, and safe neighborhoods. Marty’s defining experience as a young man was his recovery from alcoholism. He joined the recovery community, where he built his sobriety by sharing it with others. He remains a passionate advocate for those struggling with addiction, carrying the message of hope from Boston’s streets to national platforms. That’s what Marty’s life has been all about: getting things done for the people who are counting on him. As a labor leader, Marty created Building Pathways, a nationally recognized program to get low-income women and people of color into good careers. As a State Representative, Marty was instrumental in passing legislation during the financial crisis to get workers the pay and benefits they had earned; he was a leading advocate of addiction recovery services; and he was a courageous early defender of marriage equality. In uncertain political times for our country, Marty is committed to making Boston a welcoming place for all. Whether you’ve lived here for generations or just made this city your home, Marty works every day to ensure you and your family can build a good life in Boston. By working together, we can build on our city’s progress and lift up every Bostonian in every neighborhood. To all those celebrating tonight, wishing you and your families a very happy Passover!